Make sure management (the customer) understands the numbers compared to their expectations. b. They need to be flexible in their expectations to get the best value for every dollar spent where it really counts. d. The analogy is that you can spend $1.00 stripping/recoating once per year or scrubbing/recoating four times per year for better consistency. You may need to re-word some standards and prioritize high profile areas that have to be "shiny" whereas other areas simply will be clean with a matte finish. b. Try to get the specifications focused on results for key areas by having Service Level 1,2,3, etc. that defines levels of importance and necessary frequencies. c. Get rid of "all floors" being treated the same as well as "as needed" "strip/wax" – I suggest you replace wording with "strip/scrub/recoat"
d. Implement targeted cleaning cycles based on priority, traffic and of course budget. Remember that your greatest cost in a service type contract is labor and benefits so how can you increase productivity, which results in performing the tasks faster? a. Research automation, riders and more cost effective systems – think labor savings. b. Test and justify any and all equipment/systems before going companywide with implementation. Consider removing the annual stripping and refinishing requirement on select areas since it is probably a waste of time and resources unless you have the budget to buff/burnish/scrub/recoat during the year. a. Most finishes (wax) simply does not last that long between recoats and maintenance. b. Avoid going the urethane route since if probably will not give you the results you hope for in the long term. Take a hard look at testing out automated equipment that will increase productivity. Take a hard look at team cleaning (where practical) as well as microfiber mops, double buckets, quadrant cleaning, etc. Be sure to have a robust QC program that documents results and implements training to correct deficiencies noted. Engage your vendor/distributor/chemical rep for training and problem solving. b. 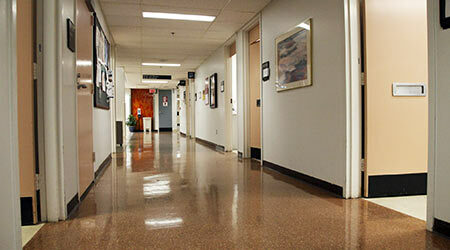 Realize that floor care is a specialty that requires a higher level of ongoing training.